Nintendo is a 8-bit console of 80s (wiki). AI plays noob chess. 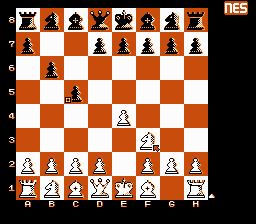 A small chess book inside, one move evaluation. This .NES file is ready for loading in emulators FCEUX, Nestopia, Jnes, others. The C-code is compiled on cc65 compiler for 6502 cpu. 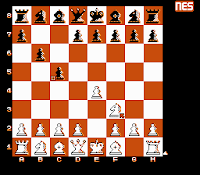 JS Chess NES is an online browser version, thanks to Nezulator emulator.